The Rotaprint company was a German printing press manufacturer and is considered a pioneer of small-format offset printing. For a long time Rotaprint was synonymous with small-format edition printing. Founded in 1904 as the Deutsche Maschinenbau- und Vertriebsgesellschaft (German Machinery Manufacturing and Distribution Company), the company began its production at Reinickendorfer Straße 46 in 1916 and, as an important creator of jobs in “Red Wedding,” it had a lasting influence in the following decades on the city block between Gottschedstraße and Wiesenstraße. Rotaprint was renamed in 1925, and the company grew larger and larger, exporting printing presses worldwide. Rotaprint printing presses were indispensable machines for running offices and businesses, but also for the leftist protest movements of the 1960s. At the end of the 1970s, new advances in electronic technology began to threaten the small-format offset printer. Rotaprint began to suffer the effects, and various attempts to save the firm failed to keep it from going bankrupt in 1989. In 1906, the company produced the Viktoria copying maching, a cranking machine for printing ten to twelve copies. The Viktoria Record came on the market in 1912, followed by the Viktoria 18 in 1918. Reproduction was a sought-after technology in the years after the First World War. In 1922, the first Rotaprint offset printing and copying machine was produced, a hand-operated duplication machine that converted the still little-known offset printing process to a small format. In 1923, this machine became available with an electric motor: Rotaprint had invented the first small-format offset printing machine. In 1926, the Deutsche Maschinen Vertriebsgesellschaft was renamed Rotaprint GmbH, and in 1929 Rotaprint AG. During these years, Rotaprint developed the technology further: the Rotaprint DIN A4 roll printer with a feeder, cutter, and perforater, and then the Rotaprint R 30, a DIN A3 batch printer. Over 300 employees worked in the factory manufacturing and assembling small-format offset printing machines. During the Second World War, the company turned to armaments manufacturing. Rotaprint machines were “critical to the war effort.” The company employed forced laborers. After the air raids of 1945, 80 % of the production sites were destroyed. 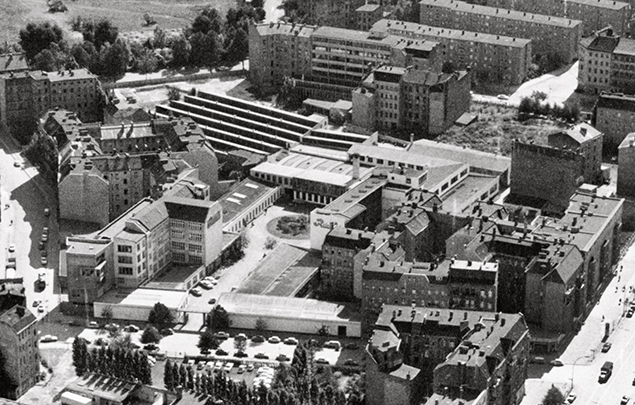 In 1951, the low-rise buildings on Gottschedstraße were constructed to replace the destroyed streetfront buildings in order to meet expanding production needs. In the same year the Rotaprint-Express, a demonstration vehicle featuring a travelling exhibition, toured around Germany promoting the new technology. Rotaprint was again back up to 500 employees. The R 20 was developed for the DIN A2 format, the R 40 with suction feeder for brochure printing. Starting in 1953, additional parcels of land were bought up in the interior area of the block in order to build production halls. In 1954, Rotaprint AG celebrated its fiftieth anniversary. In the second half of the 1950s, Rotaprint had up to 1000 employees, 60 % of the production went into exports. 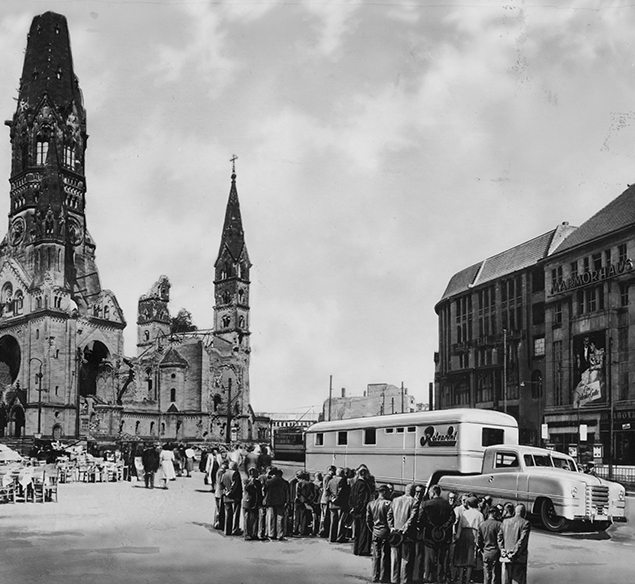 In the 1950s and 1960s, the Rotaprint company experienced an uptick in demand characteristic of the economic miracle in Germany following the Second World War. In 1968, director Paul Glatz, received official recognition for the firm’s international economic engagements. Export was an important field of activity for the firm. In the 1970s the firm began to founder. 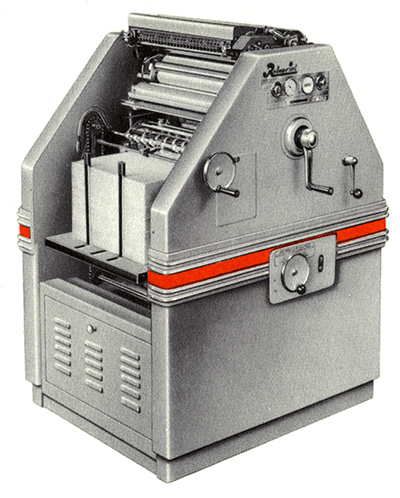 The advent of photocopying machines, and later the personal computer, replaced the small-format offset printing press, squeezing them out of the market. By the mid-1980s, the operation was heavily in debt. The State of Berlin acquired the roughly 36,000-square-meter site of the Rotaprint company at market value in the hope that the Wedding operation and its jobs could be retained for the district; 200 apartments on former company grounds were transferred over to GESOBAU and held in trust. In 1988, an American investor purchased the Rotaprint AG as a last hope. The architect Richard Rogers was supposed to design a new building across from the AEG site on Hussitenstraße. Nothing more came of it. In 1989, the world’s oldest small-format offset printing press factory went bankrupt. The operation was over 30 million DM in debt—also with the City of Berlin—and company inventory was auctioned off in October. In addition to Schering, Osram, and AEG, Rotaprint had been one of the most important employers in Wedding for many decades. Because of outstanding debts, the complex was transferred over to state ownership; the district of Wedding took over the administration of the site. Following bankruptcy in 1989, the future of the buildings was also in doubt. Berlin Regional Director of Conservation Prof. Engel is to be thanked for placing the ensemble of buildings located at Gottschedstraße 4, Bornemannstraße 9-10, and the building at Wiesenstraße 29, designated as the “Rotaprint Factory,” under strict historic monument protection in 1991, against the wishes of the district. 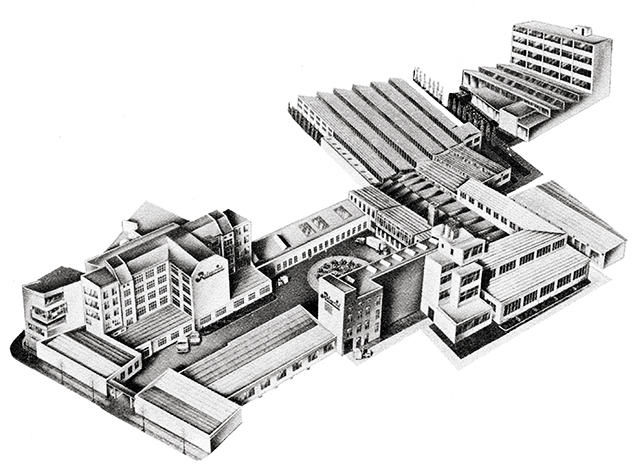 The production halls located in the interior area of the block between Uferstraße and Reinickendorfer Straße were exempted from monument status and demolished in 1992. After demolition, an extensive clean up of the soil and ground water was required and executed in 1993-94, at a cost of 6.5 million DM and paid for by the Senate. Out of an urban development design competition for envisioning a new use of the Rotaprint block came a redevelopment plan for the site situated between Reinickendorfer Straße, Wiesenstraße, and Uferstraße. The vacant lot was slated for new housing construction, which was finally built in 2016. The larger area of the site remained undeveloped for twenty-four years; a Lidl market was constructed on a section of the lot in 2006. In the 1990s, small businesses, artists, and community outreach organizations moved into the buildings on Gottschedstr. 4 / Bornemannstr. 9-10, and the building at Wiesenstr. 29. The administrative offices of the district of Wedding rented the empty spaces to temporary occupants. In 2002, the property was transferred to the assets of the Liegenschaftsfonds GmbH, a trustee of the State of Berlin with the aim of selling it for the highest possible price. The building at Wiesenstr. 29 also became an asset of the Liegenschaftsfonds but as a separate property. 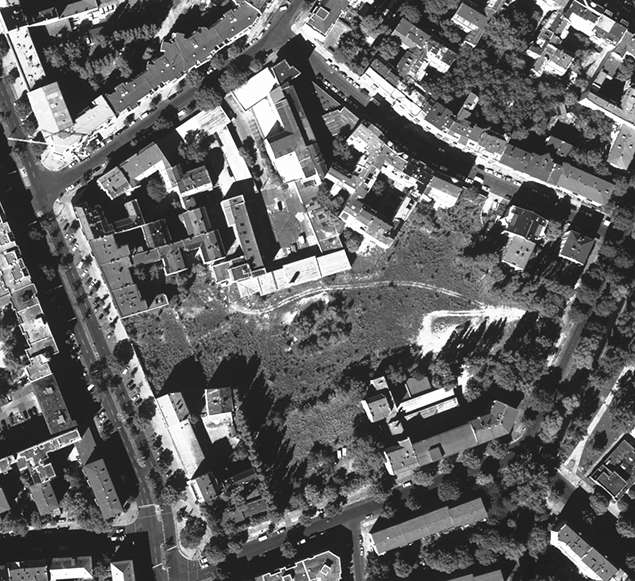 For marketing purposes the Liegenschaftsfonds divided the parcels up further in 2004—into the vacant lot located on the south-side, which had been transformed into a small wooded area following cleanup, and the building ensemble under historic protection located at Gottschedstr. 4 and Bornemannstr. 9-10. In the same year, the discount supermarket chain Lidl purchased most of the vacant lot between Wiesenstraße and Reinickendorfer Straße. In 2006, a new Lidl market was built directly up against the architectural monument, downgrading the status of the historically significant Carpentry and Training Workshop Building from 1958. The selling of the property by the Liegenschaftsfonds and the construction of the Lidl building were impetuses for establishing the tenant-initiative of ExRotaprint.